Wonder what you can let your kids do for Halloween? Why not let them design fun Halloween doughnuts for their snacks. Here are some ideas. Designing Halloween doughnuts is a fun activity — especially for homeschooling kids. Halloween is fast approaching so we are seeing a lot of spooky designs, even on our food. 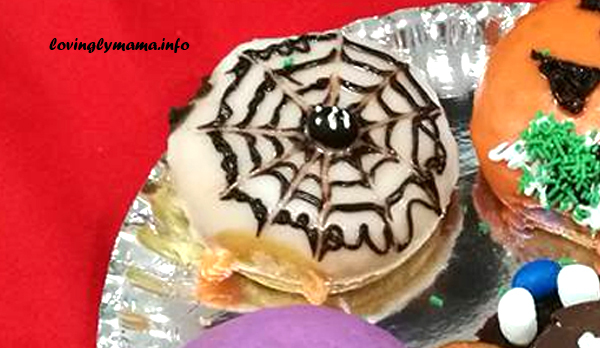 As part of the World Bread Day celebration, Bacolod-Negros Occidental Bakers’ Association (BACNOBA) held a Halloween doughnut decorating event. 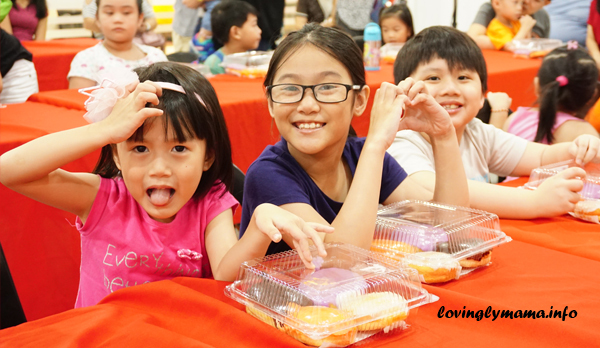 This was held at The District North point. These three homeschooled kids are super excited for the activity. 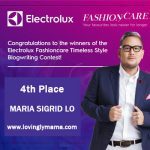 The event was sponsored by the Philippine Foremost Milling Corporation. 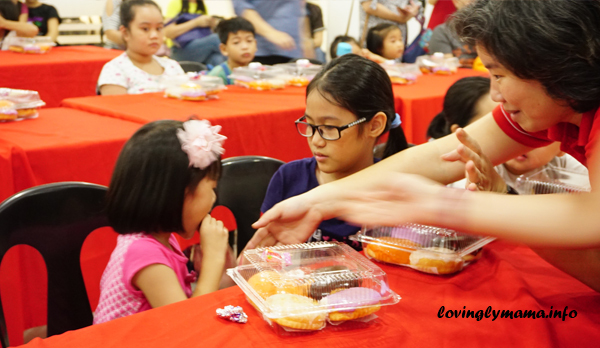 Our homeschooling in Bacolod kids were given four doughnuts each to design. The organizers were going around, guiding the kids and giving them materials. 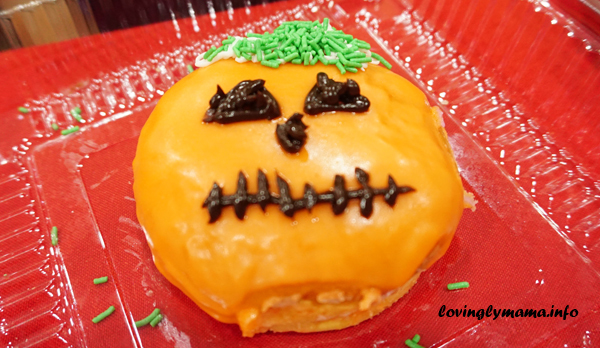 A Halloween pumpkin doughnut design made by Dindin. This can be a fun and not scary Halloween activity for kids. While we do not really “celebrate” Halloween, we just celebrate our kids’ creativity here. We allow them to create these popular Halloween and let them explore their artistic side. We don’t buy spooky toys though. As for costumes, we they do have a costume party at ballet school. But there is nothing scary there, too. Here are the Halloween doughnut designs that the kids did. Shane “draws” on her doughnut using chocolate icing. Squeeze some vanilla icing on one side of the orange doughnut to make the pumpkin hair. Then sprinkle the green candy over it. For the eyes, nose, and mouth, use the chocolate icing. Draw big triangles for the eyes and fill them in with the icing. Draw a smaller triangle for the nose. For the mouth, you can draw any lip design. Our daughter Dindin drew a horizontal line and some vertical lines to form a stitch. Open your Choco Mallow but don’t eat it like my daughter Shane. 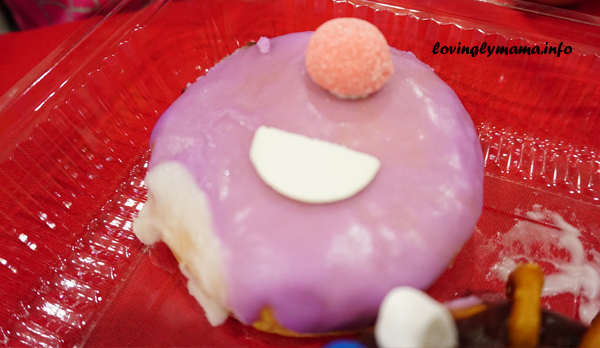 On the flat side, put some icing and stick the mallow on top of the doughnut. Cut the curve parts of the pretzels and use them as spider legs. Attached four on each side of the doughnut. Put icing on one side of the two marshmallows and put them on the front part to become the eyes. Just below the eyes, stick the M & M candy with some icing to become the mouth. 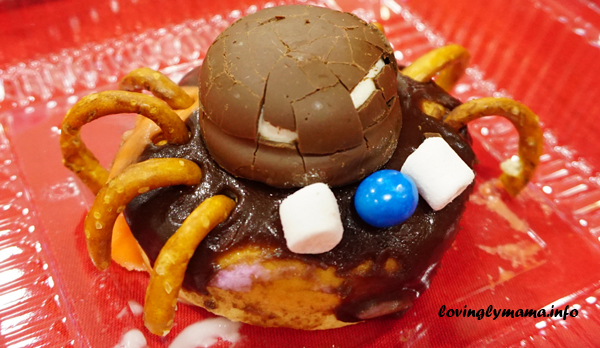 A Halloween spider web doughnut by Cody. Draw a small circle in the middle of the doughnut. Space it out, about 3/4 of a centimeter then draw a bigger circle. Continue to do so until you reach almost the edge of the doughnut. Just leave a bit of margin towards the outer sides. Using a toothpick, lightly draw a line from the middle going outwards. Pulling the toothpick like that will make chocolate line smudges on the white glazed. Do it all around the doughnut to make the web. Using the chocolate icing, put some at the back of any colored M & M candy and stick it anywhere on the web. That’s your spider. Halloween One-eyed Monster doughnut design by Shane. This is actually pretty easy. You could actually put chocolate icing on the eye for the pupil and some drawings on the mouth. Put some icing on the flat side of the Potchi and stick it in the middle of your doughnut. Then put some icing on one side of the communion wafer and stick it below the Potchi to become the mouth. You can squirt some chocolate icing on top of the Potchi to become the pupil. You may also design the mouth. Dindin puts some icing on the Potchi for her monster eye. Doughnuts are pretty easy to make, so you may opt to cook them at home. You can make several batches and ask some friends to come over. Then the kids can have an afternoon of Halloween doughnut decorating. 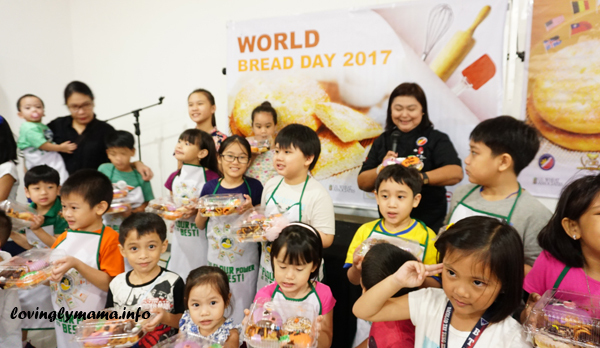 Afterwards, the kids received aprons for a job well done during Bacolod’s celebration of World Bread Day 2017. 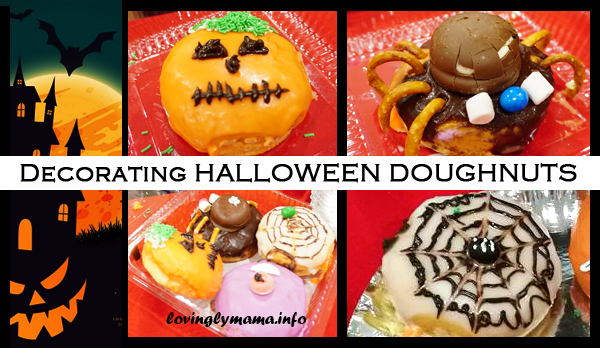 Hope you enjoyed these Halloween doughnuts as much as my kids enjoyed making them! 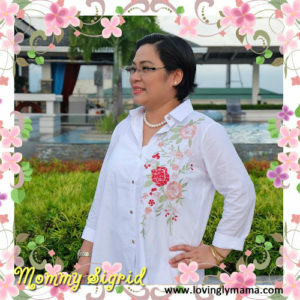 As we are homeschooling, we continue to look out for worthwhile and fun activities like these to enhance our kids’ creativity. And most of all, it’s free! 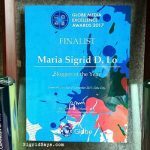 Acknowledgements: Thank you BACNOBA for doing this every year and for inviting us, too. 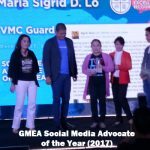 Thank you, Madam Chole Chua of Quan and Mr. Arvin Chua of Foodman. 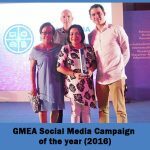 This is our third year to join these. 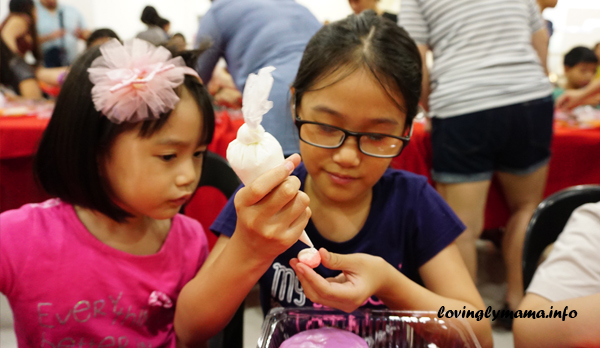 And the kids had a lot of fun each time. And each time has been a different fun project for them. 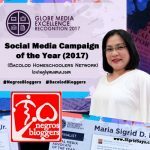 Thankful to BACNOBA for this activity. I hope they keep having one each year. 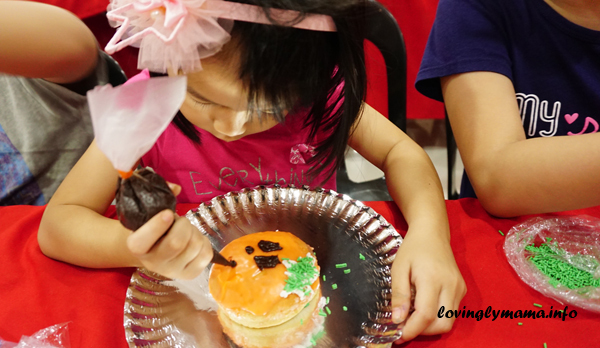 We don’t celebrate Halloween, but I am sure my kids would enjoy decorating donuts as a fun activity time. Now you’re making me hungry. My kids love decorating cookies, so donuts would be a real treat for them this Halloween. They look great. Oh wow these are amazing!!! What fab ideas, my kids would go crazy for these. I need to try making them Halloween doughnuts at home! Those look like a lot of great themed donuts. I would love to try making some of those in the house. I know my daughter would have a lot of fun with it for the Halloween. These are so cool and fun! I especially like the spider one. The problem is, my youngest will want to keep it as a pet, he loves all bugs! This looks like a lot of fun. How awesome for little ones to get involved making Halloween treats! Halloween is so much fun and I love doughnuts so now, it is a challenge to make some great ones. The spider design is my favourite. Hahaha .. and these Halloween donuts are so pretty. I’ll have to try to make some of them and I’ll make my kids happy. Wow! These are great ideas for Halloween activities for kids. The spider doughnut looks so cute. Hope they can organize another design session this year.